"Mutated monstrosities of vile appearance, should be enough to surprise even the most zoologically aware adventurers." Notwithstanding this star-billing, Mutant Goblins barely made it into the game itself. 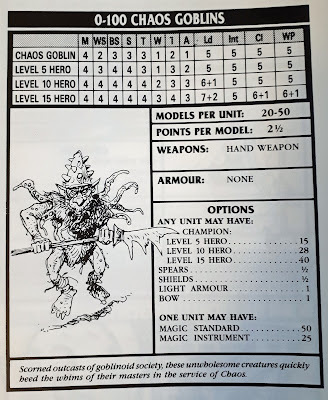 They snuck into Warhammer Armies (1988), but only as an afterthought in the Chaos Ally Contingent. And after that, they sunk from the rules. I guess they really are "scorned outcasts", as per the description in the box above. Well, I like my outcasts scorned, my creatures unwholesome and my whims heeded. Let's take a look at these blighters! 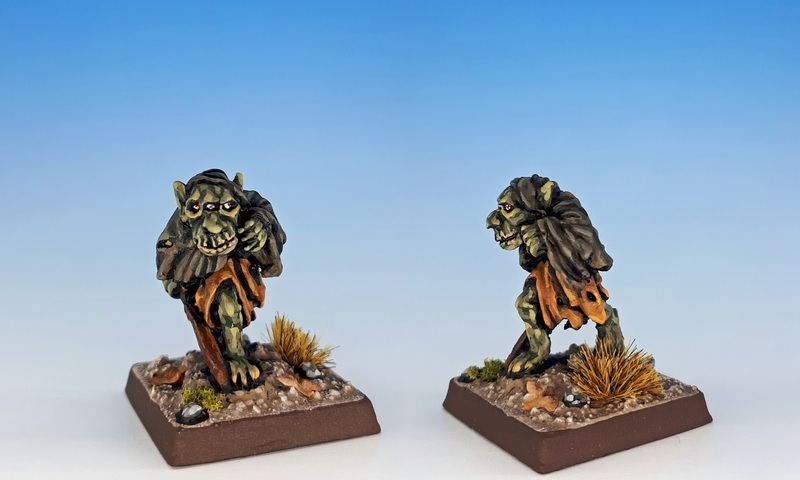 First up is the C27 Chaos Goblin Mutant "Spiky Shaman". Undoubtedly, it was this evil-eyed albino that first brought the Chaos taint on his goblin tribe. Because he craved personal power (or perhaps because his clan was seen by the neighbouring orc tribes as a delicacy), he turned to worshiping the Ruinous Powers. They next thing you know, there are spikes growing out of your back and people start calling you "sir". Above we see "Twins". I tried to give each of his faces a distinct personality. To me, they look a little like Jack Lemmon and Walter Mathau from the Odd Couple (1968). Here is "Mace-tail". His friends call him that because he has a mace for a tail. Goblins are very literal minded folks. I like this model's tusk like teeth. It's details like that that make this range so much fun. Above is "Horns". I'm no great shakes at free-hand painting, but I did enjoy giving him and his friends a simple chaos symbol ("The Arrows of Chaos"). This particular miniature was beginning to get some lead-rot when I painted him, giving the final product a pebbly-texture. I hope he doesn't decay further now that he's safely entombed in a few layers of acrylic and varnish. 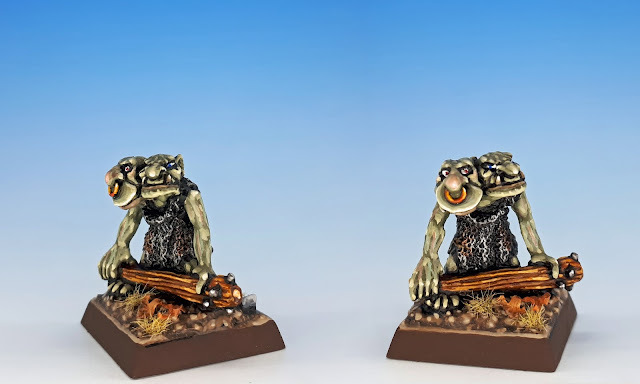 And our final miniature today is one of my favourites, "Three-Eyes". Besides the third eye, I love the skull-like face that the Perrys gave him -- no to mention his skulking demeanour. Well, I hope this was enough to surprise even the most zoologically aware adventurers. Next week we'll look at the last five miniatures in the range. 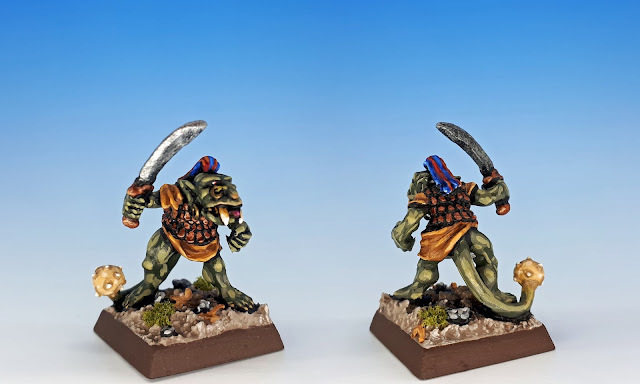 In the meantime, I encourage you to check out the work of other painters who have tackled these mutants, like JiNNai and Goblin Lee and Don Hans. Really really beautiful! Love those gobbos! For future reference, the diecast toy community have similar problems to lead rot with diecast models corroding and apparently recommend soaking them for several days in vinegar - I have tried it myself with some old diecast military vehicles that I have been re-furbishing and seemed to remove the corrosion - too soon to confirm whether it has worked in the longer term though. Ian - thank you so much for that tip. I have a couple old and not-too-valuable models that I can experiment on. I will certainly try this, and will report on any results. If you get any further insights on the issue, please let me know. I didn't know these models, you did a great job on them! Thanks Jaeckel. Because they came out in 1984 (pre-3rd edition), I think they fell under a lot of people's radar. Gantastic work as always mate! Some real holy grails here ! Yep - some of them are pretty rare on eBay. It took me a while to gather them all up. If the mutant goblins come to your house, they will cause your other miniatures to mutate. Soon you'll have tentacles everywhere. Each one of them is so unique! Your painting style makes them stand out, I love their freakish aspect, wonderful job!! Thanks Suber. I can say exactly the same thing about your Genestealer cultists. I never realized there was a range for that army entry. Very cool. Thanks for show casing it. I particularly like there is a fig for the 2 headed fellow on the rulebook cover. 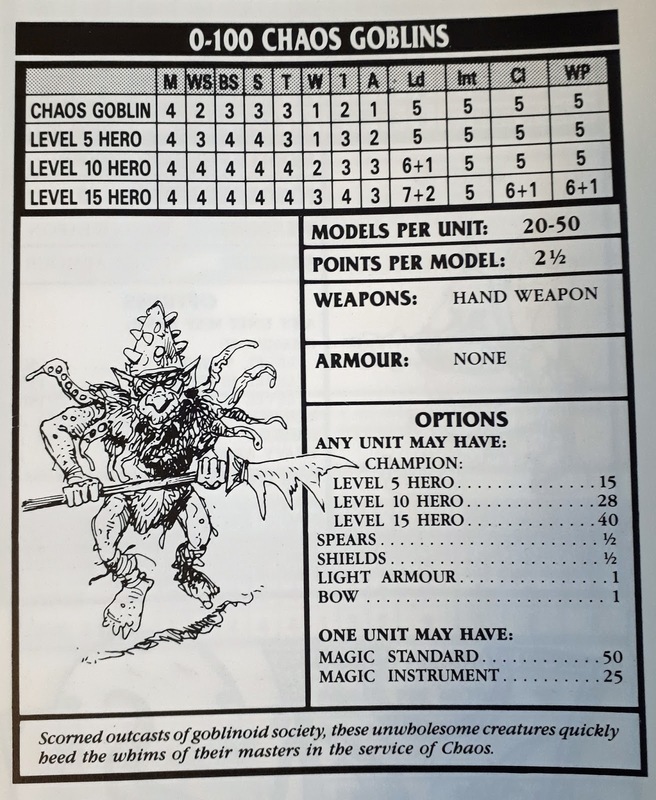 I wish there was one for the army entry (spikey helmeted octopus goblin). A 3 legged one wouldn't go amiss either. 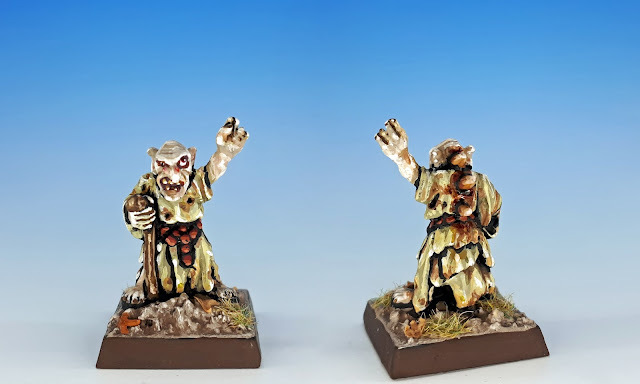 You know, Citadel did create a three-legged goblin miniature, specifically for Shadows over Bogenhafen. He's quite rare. I haven't tracked it down on eBay yet, but a boy can dream. I love Twins too. He was the first one I painted, years and years ago. The others came later. You've done a fantastic job bringing these little buggers to life Matthew. I haven't come across many examples that have been painted, let alone well, before. Egad. That's tragic about the rot. Well, all things must pass. Awesome job as usual. Can't wait for the next batch! In both sets of miniatures, there's a certain kind of pathetic-ness. I think all goblins are a little tragic. Killed by human, eaten by orcs, etc. Anyway, I hope you stop hording them and start painting them! 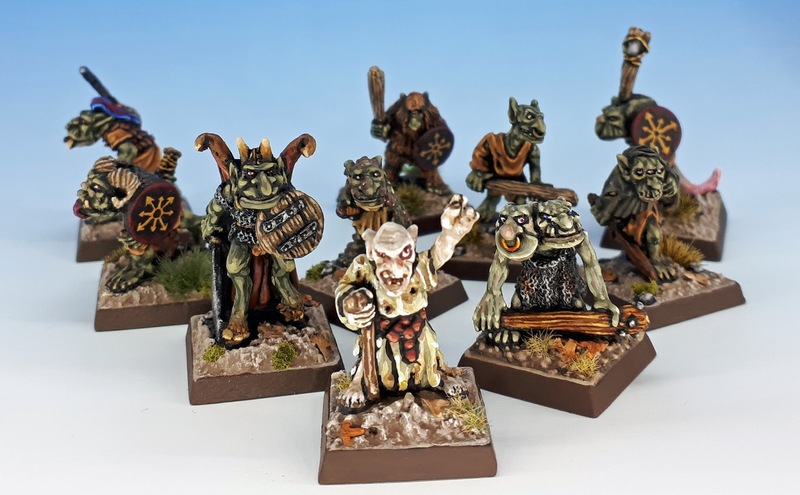 I love how you have painted your Chaos Goblins. Great depth and detailing, and I like how you painted the Chaos Star and axe on 'Horns', and the faces on the 'Twins'. You're right, they do look like the 'Odd couple'! 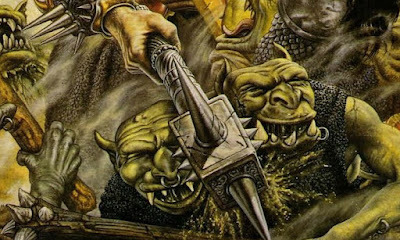 Great article about the Chaos Goblins background as well. Great work, and thank you for mentioning my blog. My pleasure, GL! I'm glad that you're working on some preslottas too these days. Great fun! I like the albino’s skin, and all these figures have such character! 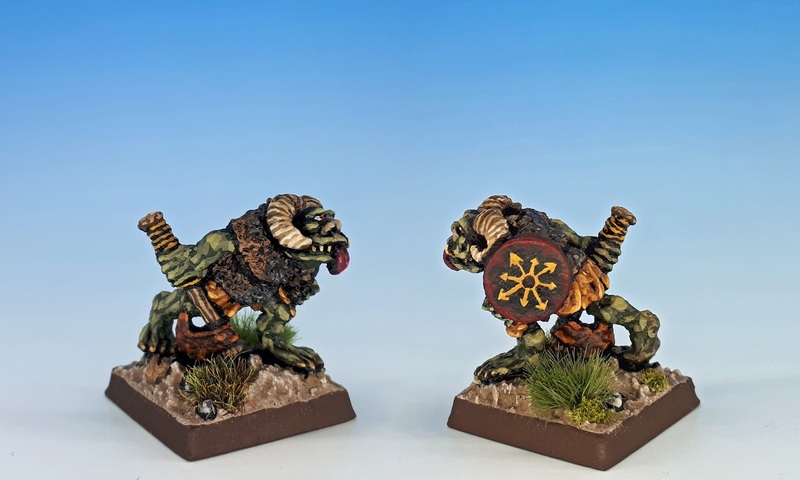 Ooo, I do love me some Gobbos who've lost their way in life. Whilst I was aware of this range, I'd never seen any painted examples until now and WOW mate, these look fab!